My initial research started with a trip to our library. I initially found a book/journal that contained a number of articles that started me out on reading about preservation and conservation of print, video, multimedia and old recordings from phonographs to tape recorders, to digitized material. The initial articles I found discussed the deterioration process of print materials. It discussed how the Library of Congress is experimenting with various types of chemical treatments to extend the life of books that have not become so brittle that something can be done to save our past history. It also mentioned how microfilming became one of many solutions to preserve the printed material. Other articles dealt with how institutions have a moral responsibility to preserve great book collections. At this point in time, I have not decided on a narrow topic I will write about in my paper. I started out looking for digitized preservation but found my self reading up on past preservation techniques and the problem that librarians to historians have, on preserving all types of multimedia materials, in their attempts to preserve all types of visual material giving a glimps into all areas of everyone’s life. P.S. Actually, I’m glad I have no choice but to stay home. I’ll get alot of reading and research started on the internet today seeping on my tea and honey and my kids are in school. 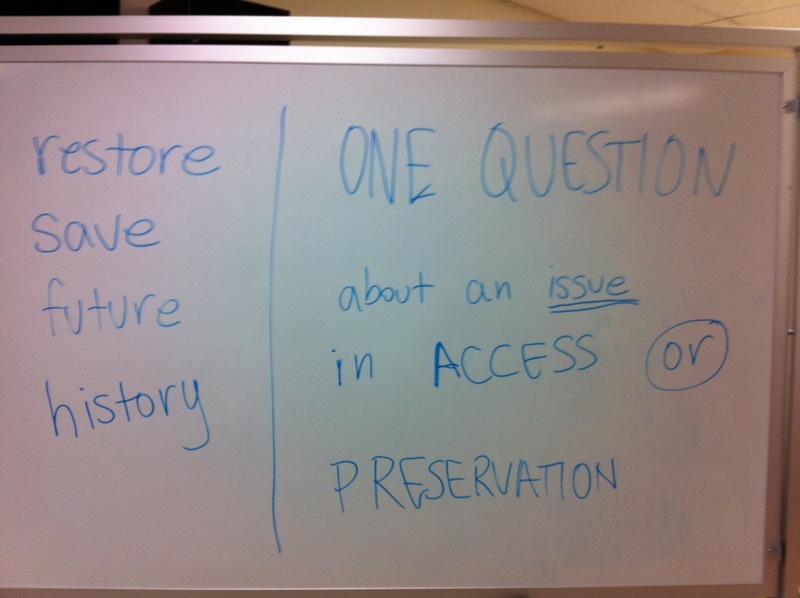 In today’s class we discussed preservation. • What’s more impt: object or content? • Marginalia and “paratexts”: important? • Who decides what to preserve? – How to handle it?